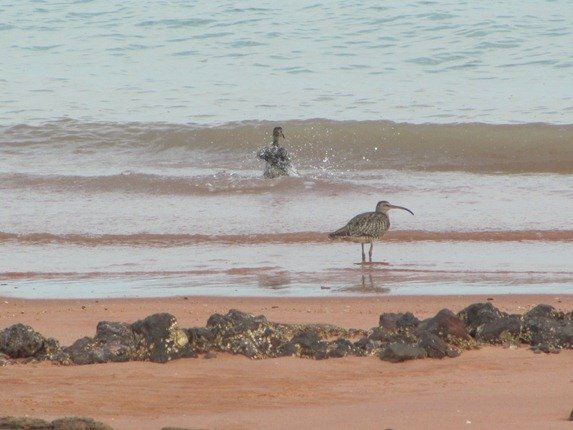 The Whimbrel Numenius phaeopus is one of the noisiest shorebirds around Broome and should you happen to not notice it amongst any rocky outcrops it will soon advise you of its presence. 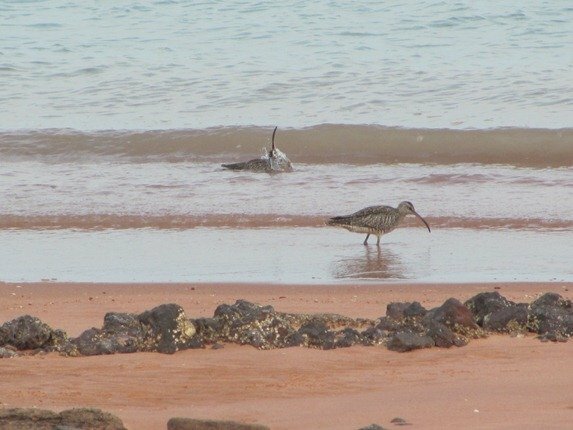 They are a large shorebird with a down-curved bill and are like a larger version of the Little Curlew. 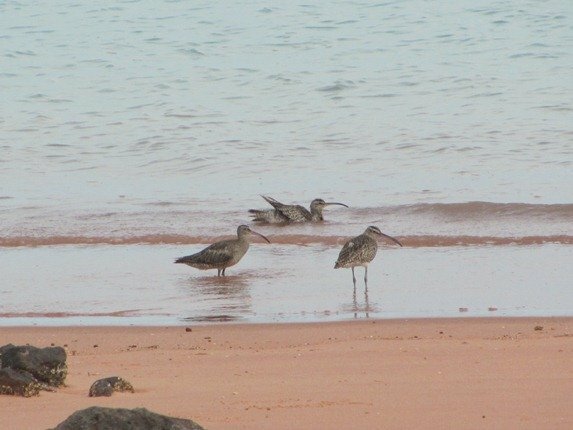 At high tide they will congregate together in a small flock and often they will roost amongst the other shorebirds. 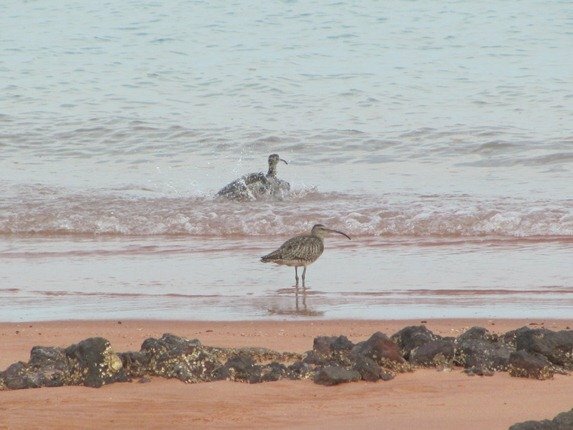 Whilst the other shorebirds are resting at high tide the Whimbrel will soon easily bore of standing still and run amongst the flock. 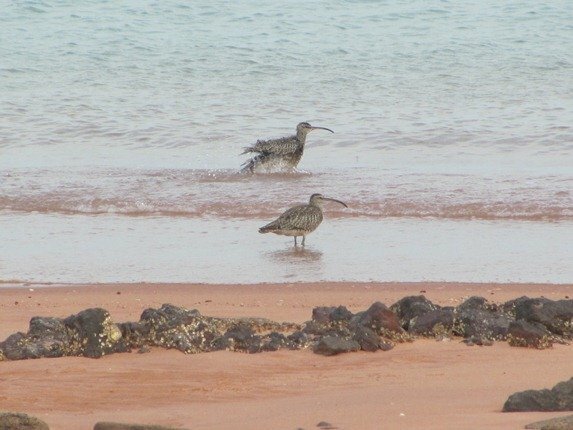 If you ever want some movement amongst a flock of settled shorebirds you can rely on the Whimbrel for that! One other aspect of shorebird life is that sometimes you just need a wash. 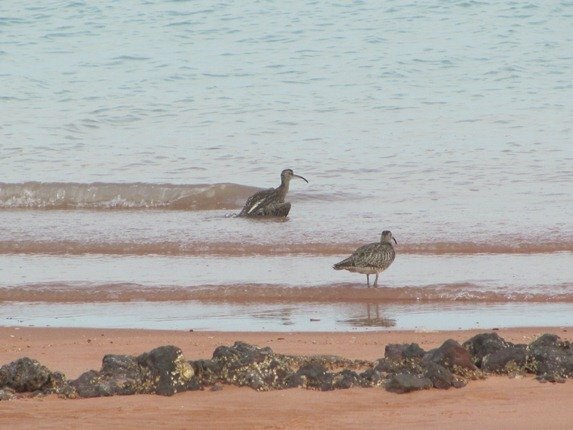 It is not uncommon to see shorebirds wash along the shores of Roebuck Bay and often it will be just after the tide has turned. 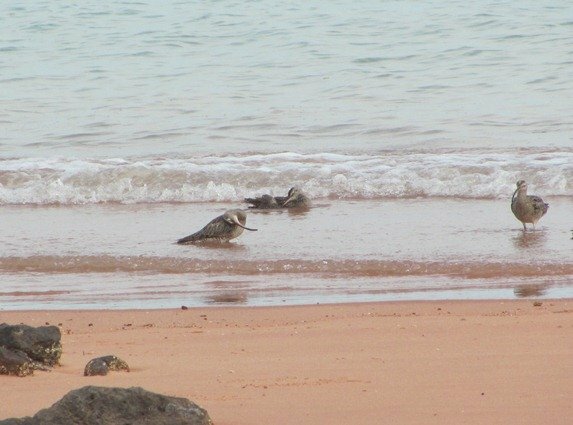 Once they have completed their washing the tide will have dropped enough and they can resume feeding. A shorebirds life in Roebuck Bay revolves around feeding, washing and going to a safe area to roost during the high tide. There is pressure from birds of prey, unleashed dogs and people, but they are able to find several places where the threats are minimised. 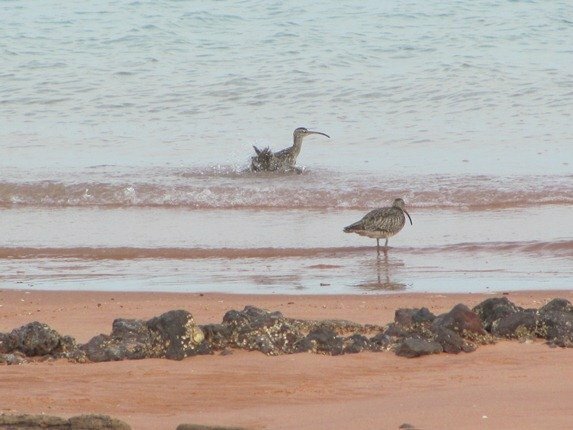 This week I saw some Whimbrels taking a wash and they really did look like they were enjoying themselves…..
Now, doesn’t that look like fun!? 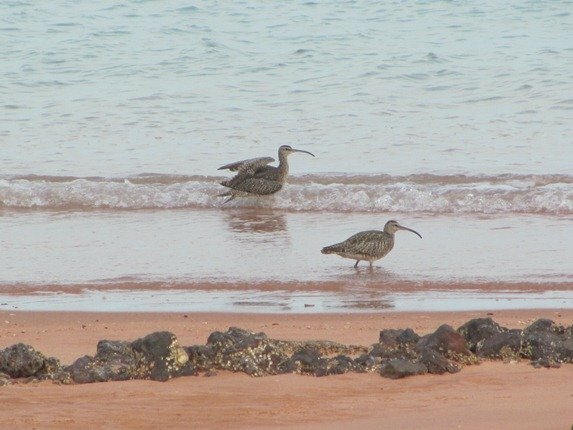 I was surprised to read about Whimbrels in far away Australia, since I’ve seen them here on the west coast of the US. Usually when I look at maps with the range of birds, it only shows North and South America. Thank you for this post, which prodded me to check the Cornell website, where I learned they can migrate 2500 miles non-stop. Amazing birds! The Center for Conservation Biology (website ccb-wm.org , then whimbrel tracking)had a satellite tagged whimbrel this fall fly nonstop for 4355 miles over the course of 145 hours (6 days)! @ Wendy-pleased you have seen these birds in the USA and wonder if they are also very vocal there?! 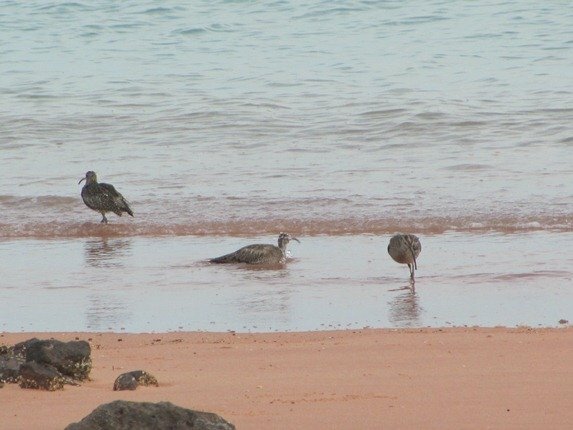 @ Barry-the satellite tagged birds have shown some amazing flights and how they get around bad weather, but unfortunately not always the hunters in Guadeloupe. 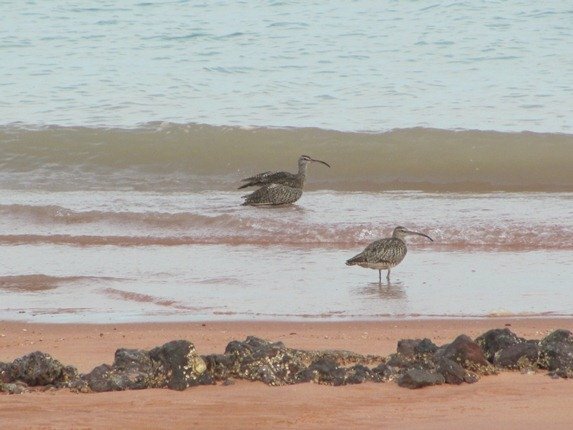 Hopefully the two satellite tagged whimbrels that were shot and killed have not died in vain and the spotlight on unregulated hunting will help bring an end to the practice in the Caribbean.